\"He was a friend to man\"
[S804] Registration Certificate for Registered Nurse issued to Rachel Francis, Province of Ontario. 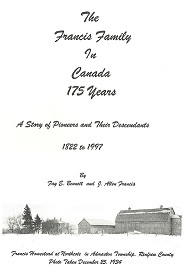 [S2] "Ontario Birth Registrations online at Ancestry.com", FamilyTree.Com, (Name: Subscription www.ancestry.ca;), # 031229 Bromely Twp., Renfrew Co., Ontario (Reliability: 3). [S502] Gravestone of Rachel Francis and John Humphries, Cobden Union Cemetery. [S574] Information from Gladys Francis Scrapbook.